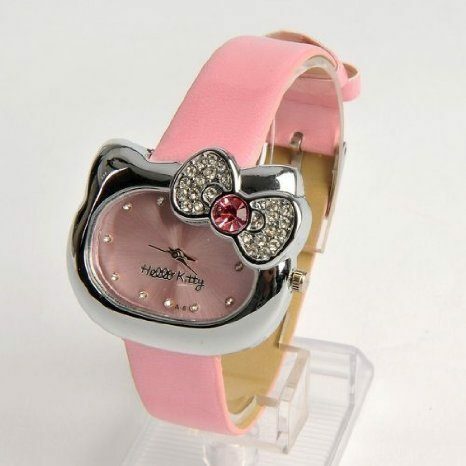 Pink Hello Kitty Watch Only $7.68 (Reg. $53.60)! You are here: Home / Great Deals / Amazon Deals / Pink Hello Kitty Watch Only $7.68 (Reg. $53.60)! Calling all Hello Kitty fans – check out this HOT deal on a SUPER cute watch! Right now, you can get this Pink Hello Kitty Watch for just $7.68, down from $53.60! And, shipping is FREE with Amazon Prime or Super Saver Shipping! I love this watch – it’s SO cute! I love the rhinestones on the bow! I wonder if it would fit my daughter because she would LOVE it!